It looks like this summer will be as hot as it was the last summer. For the past few years on this lake (situated in south eastern Alabama), anglers have reported seeing water temps exceeding 90 degrees. With air temperatures often over 100 degrees at midday during the summer months some anglers have simply resorted to fishing after dark when its much cooler. After being impounded (1963) for almost 50 years Lake Eufaula has developed into an amazing aquatic weed fishery. Over recent years, invasive weeds such as milfoil, hydrilla and lilly pads have all but choked out the lake. There now exists miles and miles of shallow weedy water, evident throughout the entire lake. Some of Lake Eufaula’s aquatic weeds become thick and matted, growing all throughout this 70 plus mile long lake, from early summer on into the early Fall season. Summertime anglers have many choices when it comes to cover choice in the shallows, whether fishing shallow or deep, or when fishing at night. So here’ some summertime fishing tips for targeting some big, largemouth bass on Lake Eufaula (or an occasional spotted bass). Both for while fishing during the hot days of summer or the more comfortable, cooler nights, when things cool down fishing for big bass beneath the stars. Getting to the lake before dawn is your first mission. Not arriving two hours after the morning bite has ceased! 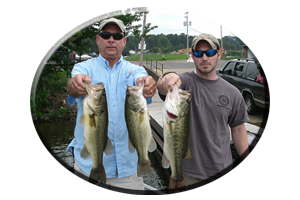 Many of Lake Eufaula’s Summertime bass may feed at night, during early dawn or late evenings. * Make plans to be making your first cast of the day at first light! Like mentioned, aquatic weeds hold some big summertime largemouth bass. So picking a weedy main lake flat, and/or a major feeder creek weedy flat nearby, is a wise decision to start your day. Take notice of any birds, baitfish or especially fish feeding activity! 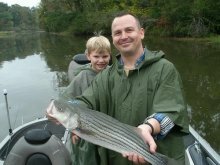 * Anytime you see any of these three given facts; feeding birds, fleeing baitfish and feeding fish…you can rest assured a school of bass are nearby. The lures you choose for summertime angling on Lake Eufaula are just as important as the location you select to start your day. So having several rods rigged and ready is suggested. Most anglers have 2-3 rods rigged, some anglers (avid anglers or tournament anglers) have as many as a dozen or more rods rigged and ready for each occasion. This can amount to as many as 20 rods in the boat, when two anglers are thinking the same way. Including half a dozen (or more) tackle boxes, ice chests, clothing, life jackets, etc. amounting to quite a lot of stuff for each angler. So adjust, maybe downsizing your rod and reel selections and tackle before hand. Its all according to the size of the boat! Some anglers may tie on five lures on five specific rods for fishing in shallow water early. Then change over later. After the morning bite slows, they may cut off all of those (shallow or weedless) lures, re-rig all rods, according to lure size, rod size and line size. Then they head for deeper water – rigging all rods for probing deeper water bass. Some anglers simply continue fishing Lake Eufaula’s shallow weedy waters as their day progresses. Probing deep within various types of thick weedy cover and thick, wood cover. 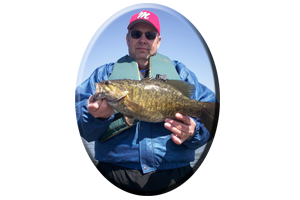 Usually done by casting weedless lures such as frogs and rats far back in weedy areas, or pitchin’ heavy lures like jig combos from a distance of 10-30 feet away. Some anglers simply employ the use of an in-close, long rod tactic. Usually armed with heavy line, for tackling big bass holding very tight to cover. This is called “flipping” their lures along weed edges, in weedy holes or along weedy lanes within the weeds, even swimming a jig combo as well. Other lures great for probing Lake Eufaula’s weeds and wood cover this summer can vary. Generally all of these lures fished on or near bottom are rigged on a jig head, with a bullet weight and hook Texas-rigged, or they are Carolina rigged. But some anglers have discovered that finesse fishing with small lures or small lure presentations and light line tackle outfits, works! Like the use of a shaky head jig or a drop shot rigged plastic, of which both will work all summer long. There are many weedless lures on today’s market. Many lures that are not so weedless. Some are very weedless lures and some are not weedless lures at all. 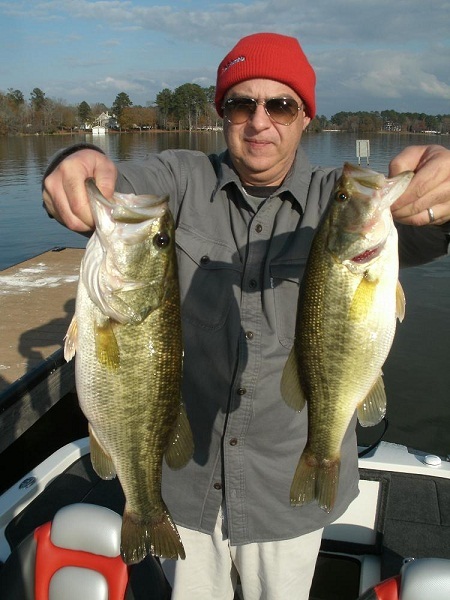 Both types can work very well on Lake Eufaula’s weed dwelling bass. 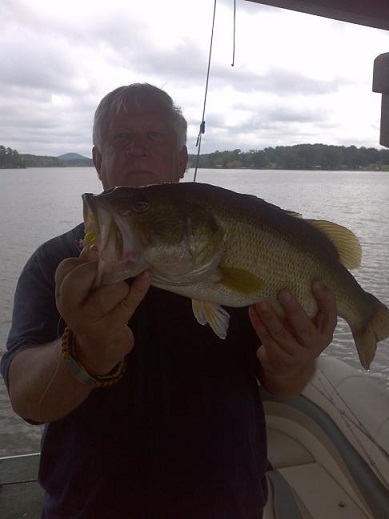 Despite the hot, stale conditions an angler may encounter during summer while fishing Lake Eufaula’s wood and weed covered shallows, there are always a few cooperative bass willing to strike a well placed lure. Always try a few of these weedless lures in and around the weeds; Frogs and rats, buzzbaits, spinnerbaits, floating worms and lizards, soft jerk baits and swim baits. Topwater lures like Zara Spooks, Sammie’s, Baby torpedoes, Spittin’ Image or Chuggers and Pop-r’s. Shallow to mid diving crankbaits. Both floating model and suspending model hard-bodied jerkbaits and rattling, lipless lures. Shallow to deep diving crankbaits are also good lures for fishing around man made rip-rap lined rocky banks, bridges and the dam area. 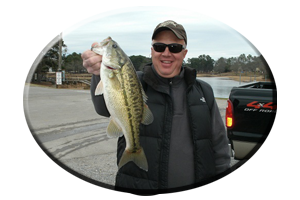 Many of Lake Eufaula’s regulars know how the lakes deeper waters can produce some very big bass during the summer months. Often some very fortunate angler will stumble up on one of those schools of big bass with nothing but 5 pound plus monsters on every cast! This is possible and it does happen! To increase your odds of this happening to you, you must do your homework first. Obtain a good map of the lake, having a GPS helps tremendously especially for returning to a sweet spot later and you will need a few floating marker buoys. Sunscreen too! Just like you have seen recently on both FLW Outdoors and Bassmasters televised fishing events, utilizing certain lures for deep water use is important to your success. Long rods of 7-8 feet aid anglers in making long casts. This is important to reach your intended location without spooking the bass with the boat in to close. Long rods are also good for getting lures such as deep diving crankbaits to achieve their maximum depths. So is the use of lighter line in the 8-12 pound test category. Also wide-spooled reels hold more line than narrow-spooled reels. Reels with high gear ratios are important too! 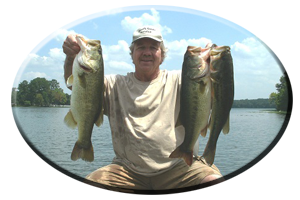 Heavy spinnerbaits in the ½ ounce to 2 ounce category can be slow rolled or simply dropped into the lakes depths along creek and river channel drop-offs, old river channels ledges and along flats or rocky banks. Big 10-12 inch Texas-rigged or Carolina rigged worms in lighter natural colors to darker models will work to. Also try creature baits, jig combos, lizards and crayfish imitations, and tube baits. Venture out on Lake Eufaula at night and you better know where you are running your boat! For instance, just out from Lakepoint Resort in Cowikee Creek is a lot of standing timber. It is marked with red and green channel markers. But if you venture out of this marked boat lane it can be disastrous to both you and your boat! Running lights must be on when navigating, fishing lights on even when sitting still…they must be on. Its the law! A spot light is a must for spotting floating logs, standing timber and stumps, and for other boaters to help see your boat at night. Fishing Lake Eufaula at night can be a challenge. So like when fishing during the day be rigged and ready beforehand. Its no fun trying to rig several rods in the dark when your partner is catching all the bass! The same lures you catch them with during the day will fool these bass at night. In addition well lighted places like piers, marinas, boat houses or rip-rap lined banks, bridges and the dam area have loads of bass at night. Worming or dropping spinnerbaits are two of the best tactics for night fishing. But never rule out those shallow bass of Eufaula that venture shallow to feed after the sun goes down! Especially from midnight to dawn. Topwater lures, spinnerbaits and other lures like frogs, buzzbaits and even crankbaits and lipless lures will all work just as well at night as they do during the day. As mentioned all throughout these summer fishing tips, there are many ways to catch these summertime bass when it gets hot. Preparing your tackle, boat and equipment for a night of fishing takes a whole day to get organized. Properly packing necessary items and checking all lights, bilge pumps, aerators and batteries avoids problems later. Trailer bearings and tires must be checked or replaced, its no fun being broke down on the side of the road in the dark. Emergency tools and safety kits are a must, for anything can happen on an all night fishing trip. Spare fuses, props (for the outboard and trolling motor) oil, gas, food, drinks and ice are hard to get after dark. Make sure to make a check list and check off all of these necessary items. Let a loved one at home know where your going, what boat launch, when you will be back and a phone number to call for emergencies when you are gone night fishing. * A cell phone can be a life saver. Have a safe enjoyable day fishing trip and/or a safe night fishing trip this summer season! Practice Catch and Release. Always wear your life jacket and kill switch. Watch out for the other guy and be safe and courteous on Alabama’s crowded lakes this summer.